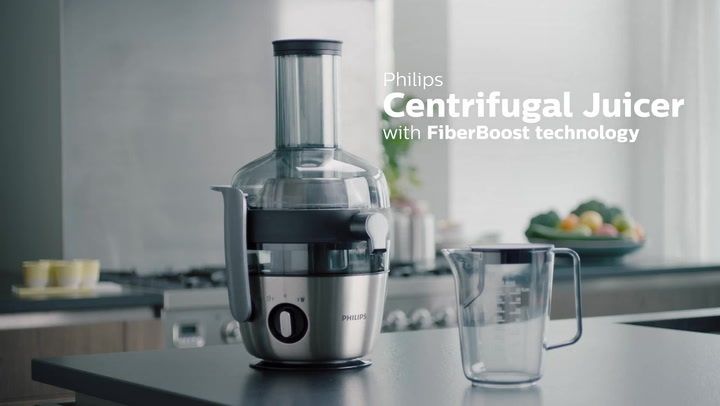 The Philips Avance Collection Juicer has FiberBoost technology that enables you to choose the texture of juice you prefer. With the switch of a button, you can select from a refreshing clear juice to a creamier juice with up to 50% more fibre. View more from Gifts for The Health Conscious, Juice Extractors, Philips Food Prep. Worst juicer ever! Pulp still contains half the juice. Total waste of expensive veggies. Cannot handle leafy greens. Very noisy. Totally unimpressed. I am so happy! The best juicer I ever had. Juicing has never been so easy. This Philips juicer is AMAZING and so easy to use - what a win! Our entire family is now juicing first thing in the morning. It takes a few minutes to make a wonderful, highly-nutritious, delicious juice & only 5 minutes to clean! Highly recommended. This juicer is incredibly efficient, super easy to assemble and to clean. The quality of the juice that comes out is the best of any juicer I have used and it's relatively quiet. Definitely recommended!